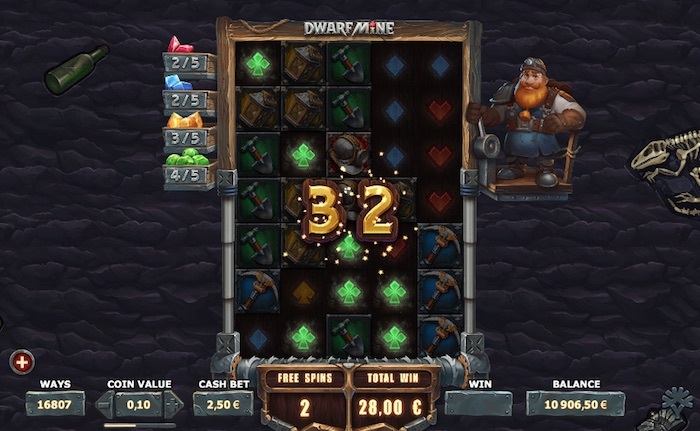 Dwarf Mine from Yggdrasil Gaming is a new casino game that sees players betting to dig treasure and rewards out from the ground. At 5 reels strong and with up to 16,807 ways to win, the slot uses Yggdrasil’s revamped HTML framework iSENSE 2.0+ for improved graphics and user control. What’s good? Firstly from £0.10 a spin it’s reasonable, the 96.8% RTP is above average and then there’s the added suspense of expanding reels. If you’re looking to mine your online casino for possible big wins, Dwarf Mine is the pit to start! As 2019 continues to push out new casino games, it’s Yggdrasil that gets our attention once again. This time, we’re joining a Dwarf in a Mine to look for riches. The theme works well; graphics and gameplay get the usual Yggdrasil effort while a 5×4 reel design offers 1,024 ways to win as standard. For freeloaders, it’s available to play free in demo mode. If you’re gambling with real money, then bets range from £0.10 to £125 on mobile, tablet or desktop. 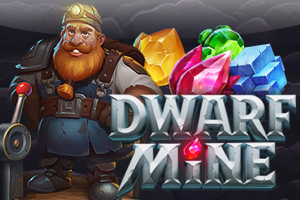 The Dwarf Mine slot offers a 96.8% RTP payout rate, a jackpot of 100 coins and a max win of 3,904 x bet per spin. 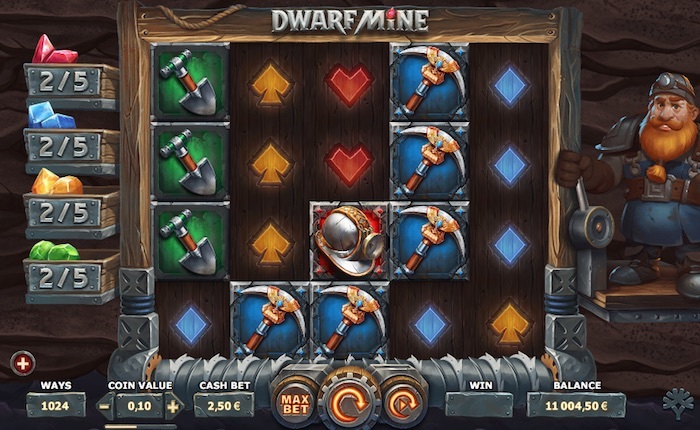 In terms of ways to win, Dwarf Mine’s game engine offers extended reels from 4 rows to 7, increasing winning ways from 1,024 to a maximum of 16,807. As Yggdrasil’s first go at mega ways, this is a big pay table with lots on offer. However, it’s a highly volatile game so expect lots of spins in comparison to the bigger wins. The main bonus on the other hand could be very lucrative. On features, Dwarf Mine uses the underground theme to build hype around some of the games better prizes. In mining, you’re trying to dig out valuable minerals; this online slot is no different only those minerals are real money wins. Take for instance the dwarven digger, a key feature in the slots design. As a clever touch, Yggdrasil uses this digger as the precursor to the expanded reels feature. Major game bonuses comprise of two free spins rounds and expanding reels that drastically improve ways to win. How much can you win playing the Dwarf Mine online slot? While there are thousands of ways to win playing Dwarf Mine, there’s no wild and that makes it highly volatile. But that said, let’s look at the pay table and see how much you can win playing for real money. As usual, we’ll use examples for the lowest and highest bets if you go for the gamble. That’s £0.10 and £125.00 a spin respectively. As for symbols, Yggdrasil includes low value crystallised card symbols, medium value symbols (mining equipment) and high paying symbols (colored gems). Play at £0.10 a spin (coin level of £0.004) and you win £0.02 for 3 x clubs, 5 x hearts pays out £0.06 and 5 x digger tools offers £0.08. Prizes above the bet cost include 5 x pick axes = £0.12 and 5 x miners helmets at £0.14. Hit the high paying symbols and there’s more on the table. 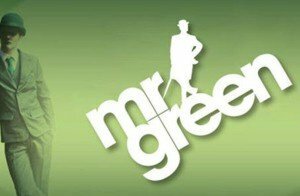 Get 4 x green gems and you’ll win £0.18, 5 x yellow gems = £0.32 while the slots jackpot of 100 coins pays out £0.40 at 10p a spin. While the prizes seem small, it has a lot to do with the huge ways to win games engine. With seven rows in play, 16,807 lines of possible winning combinations could soon boost your bankroll. As for Dwarf Mine’s maximum win of 3,904 x spin, at £0.10 a bet, the win would equal £390.40. That’s 97,600 coins! At this level you’re playing with a coin value of £5.00, this is high rolling territory, not cheap by any means. But you guessed it; bigger bets could mean bigger wins. The lowest win is now £25.00 for 3 x crystal clubs. 5 x pick axes now pays £150.00 and 5 x miners lanterns will break you even with a bet cost win of £125.00. The Dwarf Mine slot jackpot wins you £500.00 (4 x bet cost per play) while the slots max win is now a staggering £488,000. If you compare Dwarf Mine to other new casino games released in 2019, I’d put it mid way in the pack. It doesn’t have the play power of something from Play’n Go or NetEnt, but its heart is in the right place. Firstly, there’s no Wild symbol and that’s a major loss in capability, second, the pay table values could take time to add up. But if you’re going to win big, it’s likely going to be from one of Dwarf Mine’s game features. So what are these features? If we’re going to count, the slot has three features, look further, and they’re all related in one way or another. In the base game, there’s a nice touch for finding a single ‘bonus’ symbol on the games 5×4 reels as this extends the reels by 1 row (to a maximum of 7 rows). What does this mean? Basically the dwarf is digging further down into the mine and with that comes more rewards in the form of ways to win, increased as each row is added. Three bonus symbols in play will award 10 free spins played on Dwarf Mine’s maximum 5×7 rows (fully extended reels) providing 16,807 ways to win. Unlike Collectible Free Spins, you won’t find Super High Pay symbols appearing on the reels. 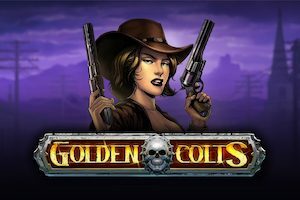 Collectible Free Spins is the one to watch! But you need to collect gems to trigger this bonus (look at the progress meter on the left of the reels for progress). Once a gem count is full, you’ll get 5 free spins played out on the huge 5×7 reel set. What’s new? Super High Pay symbols that’s what. For the Dwarf Mine online slot uneducated, that means additional jewels dug up from the dirt, others might call them big win symbols. In collectible free spins, all previous standard symbols are removed, with only crystals/jewels appearing on the reels. Big win potential? Definitely! Dwarf Mine is all about the ways to win, as Yggdrasil ventures further to combat the bigger games developers; it seems they’re using mega ways pay lines to do it. But does mining beat the competition and will digging deeper pay off? As an online slot theme, a mine full of rewards works well; we like the graphics and iSENSE 2.0+ makes mobile play more engaging. But expanding reels is the big takeaway here, 16,807 ways to win from just £0.10 a spin. The Dwarf Mine slot is a new direction from Yggdrasil who goes underground to prove they can come up with something new!